CommandWear is a mobile and wearable situational awareness software platform used by police, fire, EMS and security teams around the globe. In direct response to customer feedback, we are pleased to announce the immediate availability of Version 4.0 of our Communicator app for Android smartphones and Android Wear smartwatches. CommandWear is pleased to have its poster presentation selected for display at the 2016 Canadian Paramedic Chiefs Conference. The poster describes how the CommandWear mobile and wearable situational awareness software platform has reduced response times and enhanced paramedic safety. We have listened to customers’ requests to enable a seamless integration of CommandWear’s data with customers’ dispatch and fleet management systems. CommandWear manages real-time responder location data in its server. CommandWear Connector is a web-service based API that allows first responder location data to be published in real-time to 3rd-party systems. CommandWear received very positive feedback from a major federal department who recently deployed our software during a multi-agency critical incident exercise. 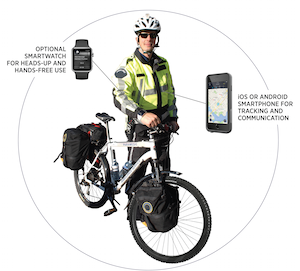 CommandWear has been invited by the US Parks Police to present its situational awareness solution in Washington, DC on April 5, 2016 (11:00 Eastern). The Technology Demonstration Day will showcase several leading crisis communications solutions. If you would like to attend this free event or receive more info, please contact Mike Morrow, CEO, at mike@commandwear.com or call +1.604.761.3647. The Pan American Games are the world’s third largest international multi-sport Games; they are only surpassed in size and scope by the Olympic Summer Games and the Asian Games. The TORONTO 2015 Pan American Games took place July 10–26, 2015 and over 1 million spectators watched close to 7,000 athletes from across Latin America, South America, the Caribbean and North America compete in 36 sports. El Niño drenched San Diego with several heavy rainstorms leading up to Jan 6-7, 2016. Streets were flooded, some to depths of several feet deep, causing vehicles to be trapped when trying to get through intersections. People who tried to cross streams or rivers became trapped in life threatening situations and had to be rescued.